Freshly Squeezed Reviews: Hit Me! ToDo Lists, a necessity of the 21st century. Computers were supposed to provide us with more free time for personal enjoyment. Instead, we’ve plugged that free time with even more tasks. If you’re needs are meager, you can use a very simple list app. But when you start dealing with much more involved projects, you then require more powerful apps, allowing you to create categories and numerous levels of subcategories (à la a mind node) that you can drill down into. Enter Karelia Software’s, The Hit List. You can download The Hit List for your Mac, your iPhone and your Watch. For this review, I will focus on the Mac version. (A watch isn’t in the finances, yet, but we’re working on it. 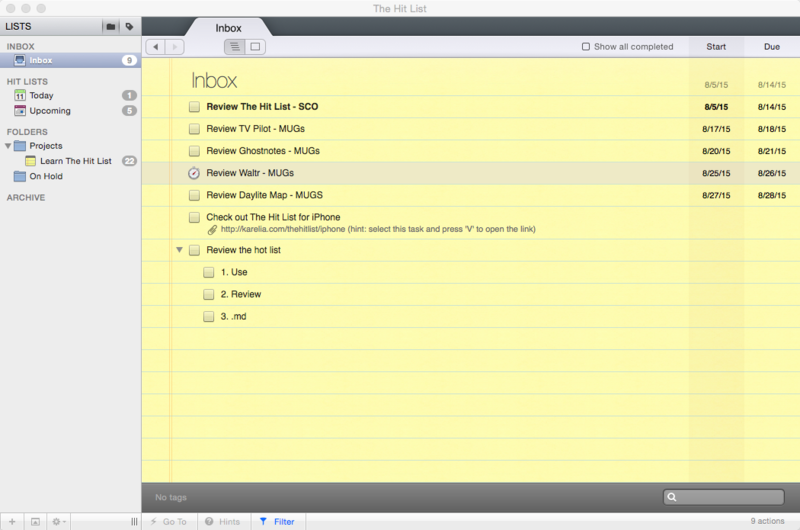 The Mac UI is very clean and simple, as opposed to some ToDo lists, whose UIs instill fear in me. (I lie. I tried the iPhone version. Again, a very clean UI.) 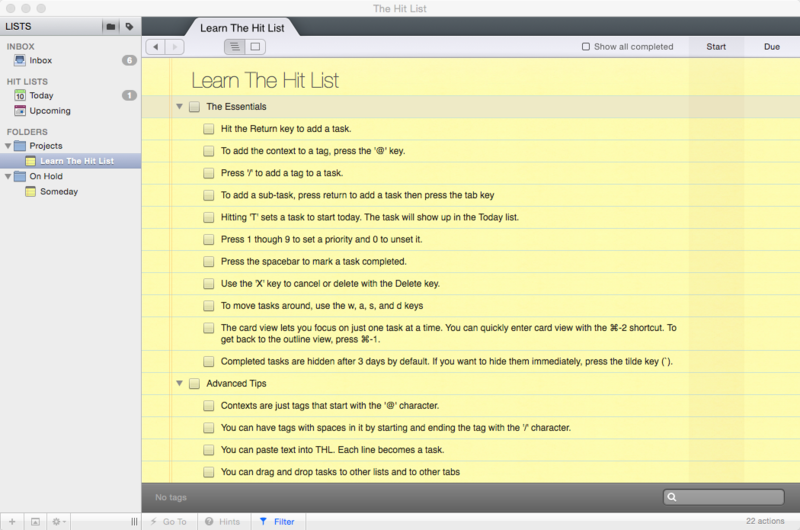 Instructions on how to use The Hit List’s features on your Mac are conveniently located in the sidebar, inside the Projects folder. You can set The Hit List to two different views: List view or Card view. You can easily toggle between the two with simple keystrokes. List view is simply that. Card view allows you to add more detailed information related to your tasks such as addresses, times, hyperlinks, et al. You can even drag and drop photos into Card view. Also from within Card view, you can set up repeating tasks. As an example, you could create a repeating task by typing Cmd-r and then type into the dialogue box using plain English “second Friday of the month.” (To do this in List view, highlight the task and use the same keystroke to bring up the same dialogue box). Creating a task is simple. All you have to do is click the return button and enter your task. Once you’ve created your task, by clicking on it and using keystrokes, you can create tags, bring up a calendar where you can select a start date, a due date and set repeat dates. I particularly liked the Upcoming pane located under Hit Lists in the sidebar. It breaks down scheduled tasks into 7, 14 and 30 day increments. And for you GTD aficionados, there’s a feature called Quick Entry. This allows you to add a task to your list from any app on your Mac (you do have to assign a keyboard shortcut to enable this feature). Also, there’s a built-in timer. Simply highlight your chosen task, then press the “B” key and the timer will keep track of how many minutes you’ve spent on your selected project. A sync service subscription is included for the Mac, iPhone and Watch apps. Simply sign up in the app’s preferences pane. Log in on either mobile device or Mac and your data will come up for you. Support for all variations of the app (Mac, iOS and Watch) can be found on their website. And if you can’t find the answer to your question(s), you can submit them via their website (you’ll find the fields at the bottom of any of their Support pages. The Hit List shows promise, but it’s still somewhat of a work in progress and the developer tells you that upfront. They’re looking into the feasibility of Wi-Fi sync support, implementing global search (although they supply you with instructions on how to create a Smart Folder to serve this purpose) and that there is currently no iCloud sync support. But as I noted in the beginning, it can be used as a simple list maker or a GTD power tool. The choice is yours. 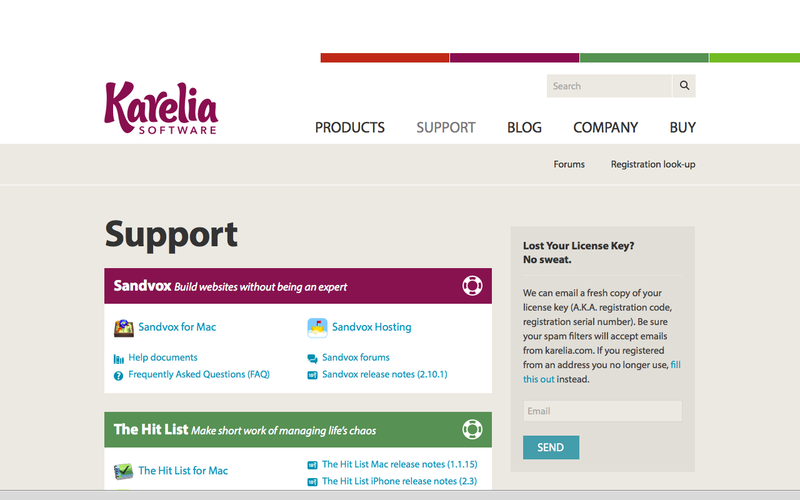 The price is $49.99USD for a single-user license $69.99USD for a household license. There’s a fully-functional 14 day triall available on their site. System requirements for the Mac are Mac OS X 10.6.6 or later. So, off you go. Kick the tires. This entry was posted on Monday, October 12th, 2015 at 1:50 pm	and tagged with Apple, Apple software, Apple Software reviews, Frank Petrie, Utilities, YMP, YMP Now and posted in Reviews. You can follow any responses to this entry through the RSS 2.0 feed. « Freshly Squeezed Op-Ed: Are 16GB phones really pointless?